Football season is here! Time to get your name out and leverage the good old American past-time as well. People are gearing up to head to fall pro and college games. Visors, sunscreen, seat cushions, or megaphones are just a few ideas to get your name out. With your logo or slogan on them, they can take you with them to the games, even if you are not attending yourself. One great item to hand out now is the Sports Schedule magnet. Your favorite pro football team and the three local colleges in your area are printed on the front, the Monday night games are on the reverse. 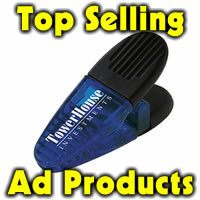 You peel off the the top area and attach your business card. 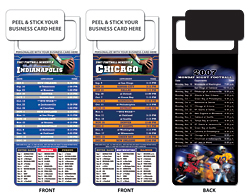 These make great handouts for fall tradeshows, fall networking and marketing events, anywhere football lovers congregate. At 49 cents for 100 or 200, they are affordable and handy. At 300 or more, the price drops to 35 cents each. Must be ordered in increments of 100. They can be drop shipped to your door. A full box makes a great donation when you are asked to give to your favorite fundraiser. Easy to tuck individual schedules into a mailing in a business size envelope. If you already mail to your clients or potential clients, why not give something that will stick around their home or office at least through the end of January. If you prefer pro basketball or hockey, those are also available at similar pricing.